This guide will help you to understand how to get started using Cayenne. 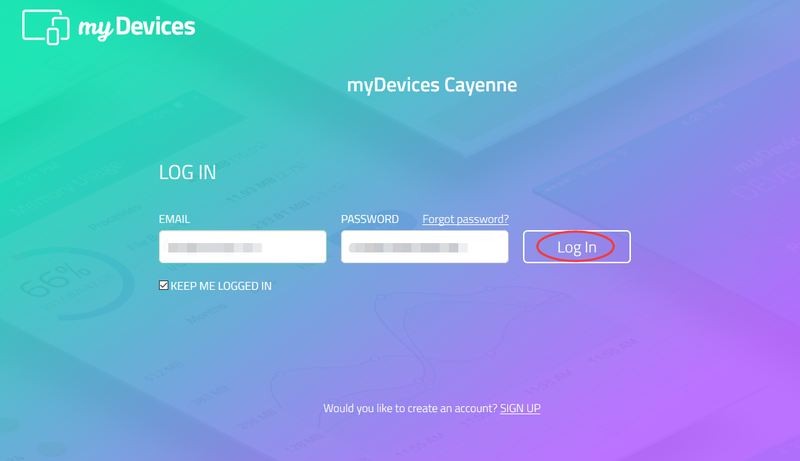 Cayenne is the world’s first drag and drop IoT project builder that empowers developers, designers and engineers to quickly prototype and share their connected device projects. Cayenne was designed to help users create Internet of Things prototypes and then bring them to production. Cayenne was designed to work from iOS and Android smartphones and popular browsers. Cayenne Mobile Apps – Remotely monitor and control your IoT projects from the Android or iOS Apps. APP is updating. It can only display data and status. It cannot be operated in real time. Cayenne Online Dashboard – Use customizable widgets to visualize data, set up rules, schedule events and more. 1)The Cayenne dashboard (online and mobile) is the main screen where you can setup, customize, monitor, manage and control your connected devices. From the Cayenne dashboard you can add board, sensors and actuators. you can fully customize your dashboard ,view device and sensor data history, set up automatic triggers and receive notification alerts. remote manager device and sensors, create your own IOT projects and so son. Visi website: https://cayenne.mydevices.com/cayenne/login, On the Sign Up page, enter your Name, Email and create a Password. Once you create an account, you then add your device so it can be seen in the online dashboard. Through the dashboard, everything on your Board is accessible. You can remotely monitor and control your IOT devices, for example, you can turn off /on a LED, Monitor temperature. Cayenne can support multiple devices as well. 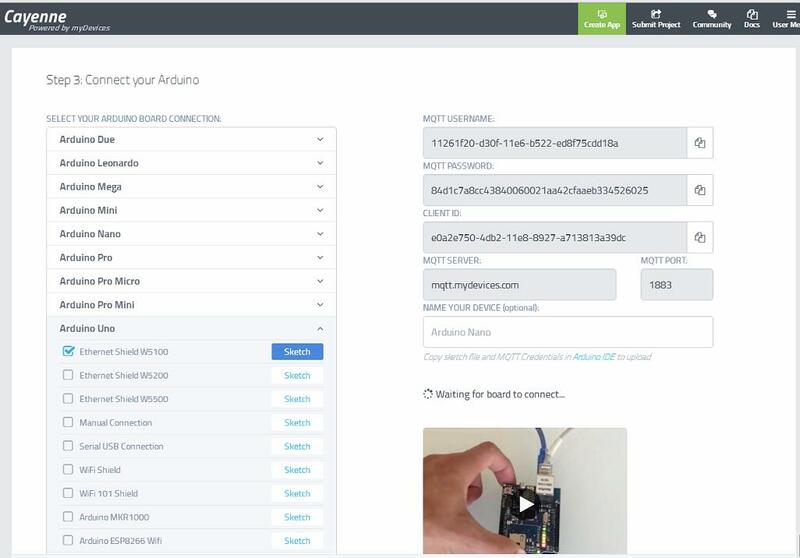 Beyond adding as many Raspberry Pi/Arduino as you want, you can select from a range of sensors, extensions and actuators that will be wired to your Board. Once the device is wired, you can then assign it to the GPIO pins. With your GPIO pins registered to certain devices, you can now set alerts or triggers to occur on schedules that you create through the dashboard. Not only can you do all of this on a laptop or desktop, but they also have an easy-to-use phone app available for both iOS and Android. Using the app. 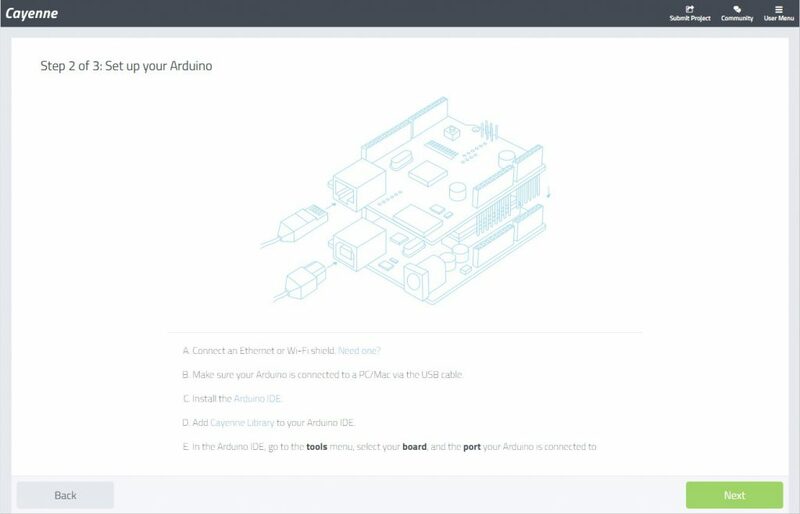 Before you can manage your Arduino device using the online dashboard, you must setup your device and install the Cayenne Arduino Library onto the device. Please visit: https://cayenne.mydevices.com/cayenne/login enter your user name and password to login. 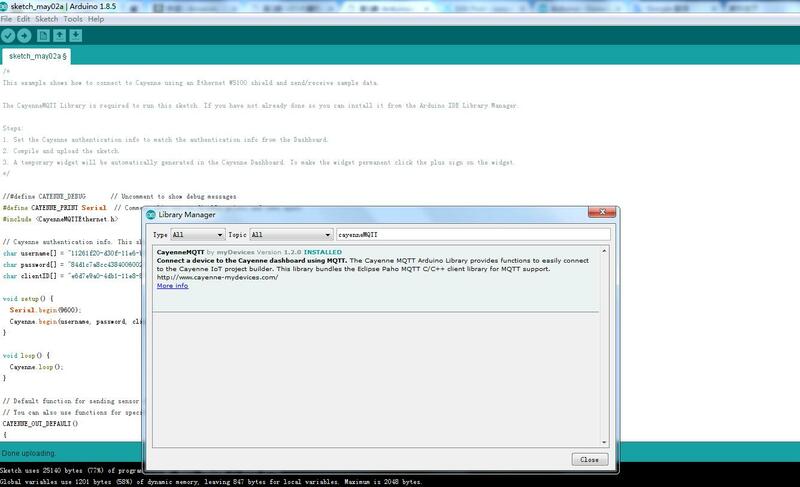 You will see the interface as followed picture, then select Arduino to start our IOT project. Power on your Arduino by connecting your Uno board with a USB cable . You should see the power LED lit on your board. 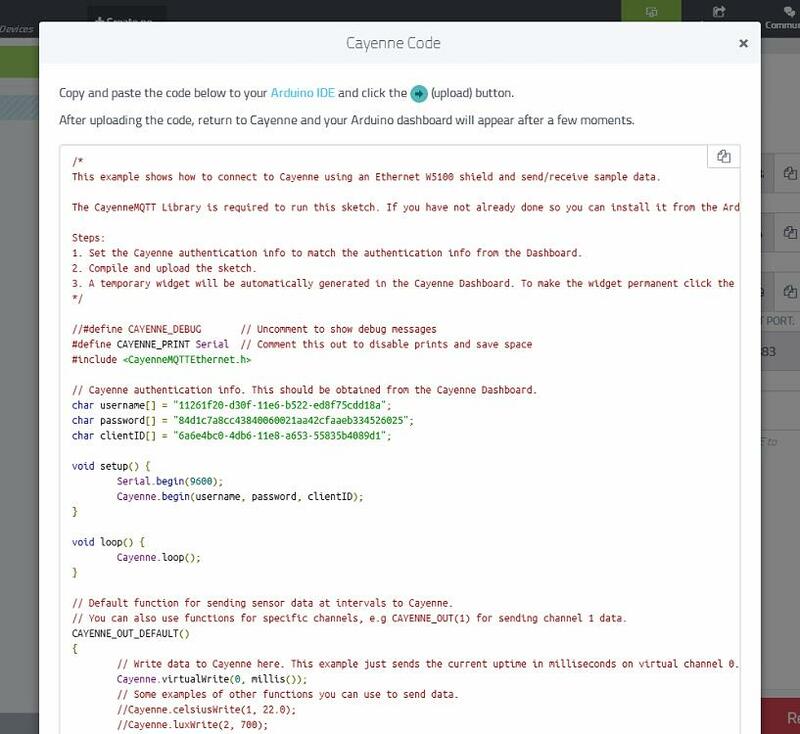 The CayenneMQTT Library is a collection of code, known as sketch files, that makes it easy for you to connect and send data to and from sensors, actuators and devices connected to Arduino boards. Cayenne sketch files can be combined with other sketch files for your IoT projects. 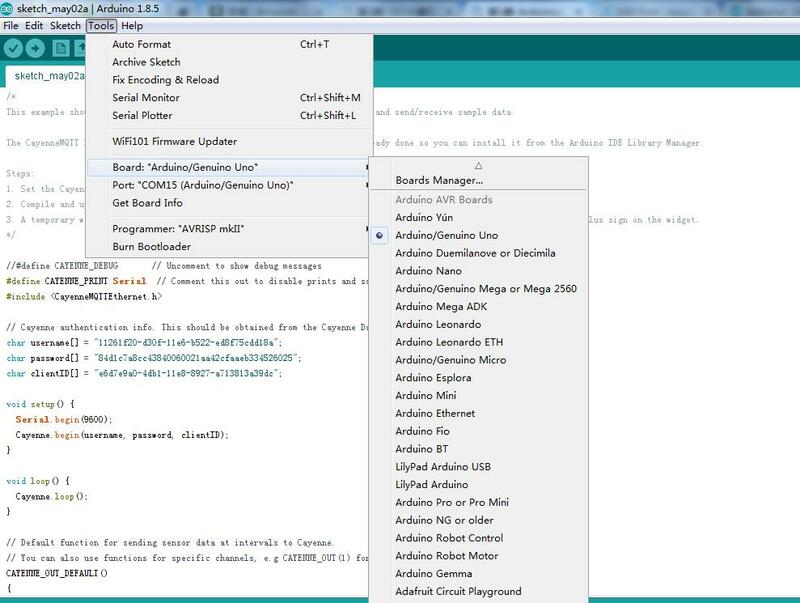 The CayenneMQTT Library is available directly from the Arduino IDE Libraries list. To install the library, select Sketch > Include library > Manage Libraries. The Library Manager dialog will appear. From here, search for the CayenneMQTT library and install it. The CayenneMQTT library has now been expanded in the libraries folder in your Arduino sketches directory. You can verify this by going to the Sketch > Include Library menu where you should now see the CayenneMQTT library at the bottom of the drop-down menu under Contributed Libraries. The CayenneMQTT library is now ready to be used in your project. In order to successfully program your Arduino board, you will need to verify that the appropriate Board and Port are selected in the Arduino IDE. First, verify that the correct Board is selected in the Tools > Board menu. Be sure to select the board type that you will be programming. Then, verify that you have the correct Port selected for communicating with your Arduino. Pick the correct port based upon how you are connecting your Arduino to your PC/Mac. After setting up your PC/Mac computer with the Arduino IDE and the Cayenne Library, you are ready to install Cayenne onto your device. Continue to Step 3 of the Arduino installation, where you will connect your board with Cayenne. On this screen, when select your Arduino board, a list of connections appears below the board name. 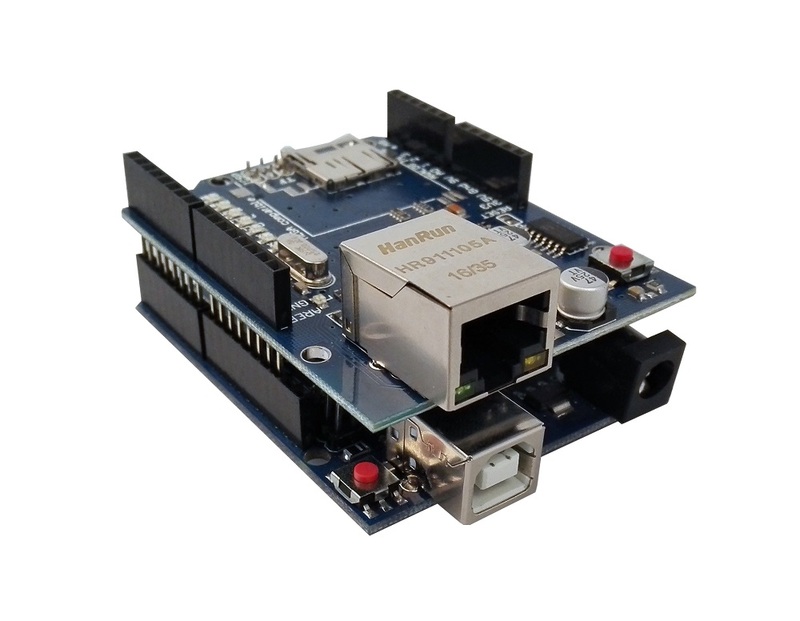 Select the Arduino Uno, and select Ethernet shield W5100. 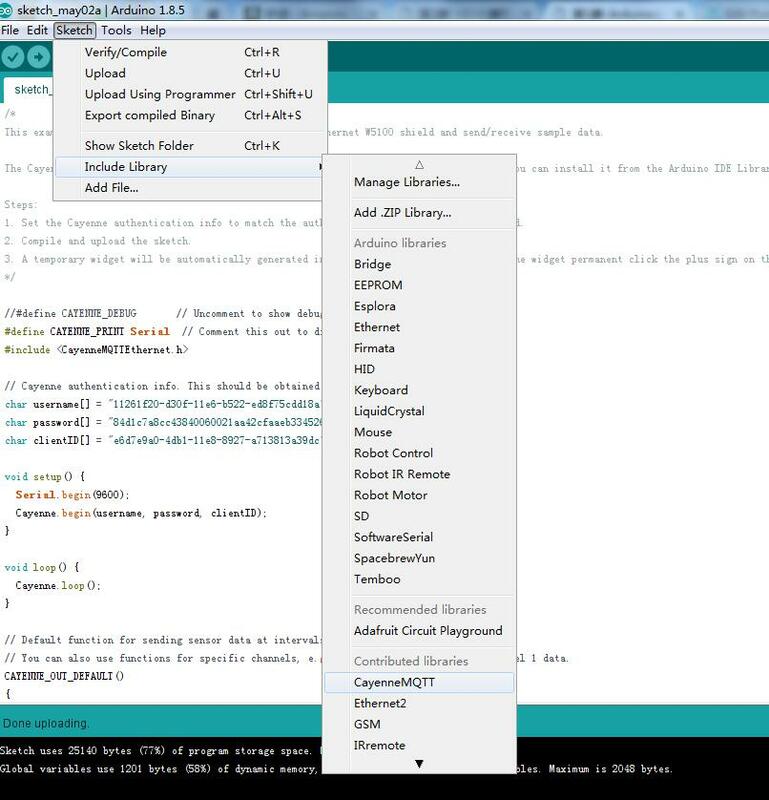 Copy & paste the sketch code into Arduino IDE and select Sketch > Upload to compile and upload the sketch into Arduino UNO board.As soon as your Arduino device comes online and connects to Cayenne, you will see your Arduino Board in the online dashboard.